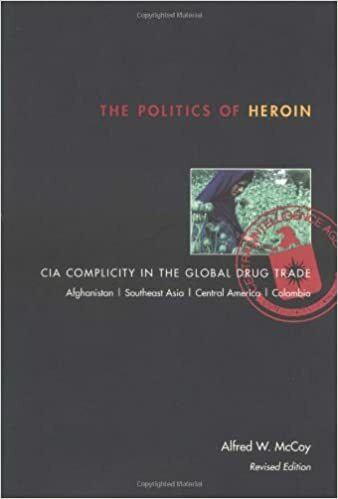 The first book to prove CIA and U.S. government complicity in global drug trafficking, The Politics of Heroin includes meticulous documentation of dishonesty and dirty dealings at the highest levels from the Cold War until today. Maintaining a global perspective, this groundbreaking study details the mechanics of drug trafficking in Asia, Europe, the Middle East, and South and Central America. New chapters detail U.S. involvement in the narcotics trade in Afghanistan and Pakistan before and after the fall of the Taliban, and how U.S. drug policy in Central America and Colombia has increased the global supply of illicit drugs. I had a colleague who worked for ‘Air America’, the CIA airlines used during the Vietnam war days. He was posted in Laos and Cambodia and he confirmed that he saw the Opium trade and the CIA’s involvement at first hand. Rafiq— You cannot prove it, That wrong accusation and sinful act of you. Be careful to wrong others Rafiq?! First of all I do have a first hand witness, whom I know personally for years and have no reason to doubt. Secondly the information is overwhelming, as this book shows. Thirdly I do not need to prove it. The Editors of TMT give different information for the readers and the readers will decide what they want to believe, like Somi, who has his ‘pre-programmed’ mind and will not change his mind even when given evidence. Rafiq— most my comment base on Holy Books—not base on News, some one told, or others. God warn people do not spread a rumor it can create conflic in society. A good Muslim does not want to insult a well known institution like ( CIA and others). Let me give you another News item: A Geneva business man received in his bank account ‘by mistake’ a transfer of 10 million USD. The amount came from the Sultan of Brunei. Years later, during one of the very rare audits of the CIA it was noticed that the Sultan of Brunei had promised to pay 10 million dollars to the CIA, so that they could continue in their ‘Iran Contra’ campaign (which was supposed to be stopped by the Senate, but the CIA ignored it. However they needed to find ‘alternative funding’ as the official budget was not forthcoming. The ‘alternate source’ was the Sultan of Brunei. The Swiss Bank made a mistake in favor of the Geneva Business man instead of the CIA’s Geneva account. – Ah well, no such mistake in my account unfortunately… I suppose the Geneva business man repaid the original amount. But he might have made quite a lot of money for the few years that he was able to keep the funds. Am I insulting the CIA? Or commending them for their ‘flexibility’ and ‘intuition’? Well, last time I visited the USA I was not banned yet … so I suppose I am not doing too badly.